If anyone proves that years and years of dedication and effort can lead to immense success, seemingly in an instant, it's Glen Hansard. The Irish folk minstrel laid the groundwork with The Frames and The Swell Season before bursting out with an Oscar-winning soundtrack number. On June 19th Hansard returns with his debut solo album Rhythm and Repose. The album is full of the dense folk music we've come to expect from Hansard. Rhythm and Repose kicks off with "You Will Become", a growing orchestral that sets the tone for much of what follows. The record can be a little too predictable at times. With several songs (like "High Hope", "Bird of Sorrow", and "Philander") that start painfully slowly before erupting into a string-accompanied gut-wrench, an obvious formula reveals itself. When that gut-wrenching climax fails to arrive, like on "The Storm, It's Coming" (I'm still waiting for it to arrive) and "Races", we're left wondering why we sat through a glacially-paced song for little to no pay off. There is the occasional drive. It subtley manifests on the insidious "Talking With the Wolves". It comes in far less convincingly on the halfhearted "Don't Leave Me Waiting", a cut that reminds one of Springsteen's listless "Streets of Philadelphia". The album standout is "Maybe Not Tonight". A slightly twangy drawl adds a depth to Hansard's wounded soul vocals that is absent much of the time. Maybe it's a case of expectations being raised too high, but I can't help but come away from Rhythm and Repose with a sense of disappointment. 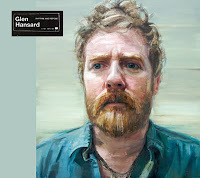 Glen Hansard plays the Danforth Music Hall in Toronto on Sep. 16th. Best tracks: "Maybe Not Tonight", "Talking With the Wolves"